QB draw on 3rd and 14 ..... LMFAO. Wow. That's all I have to say about Buffalo's instant and completely easy touchdown. That's the easiest touchdown from a return I've ever seen. He was never in danger of being tackled. Special teams coach and every player on it should be fired.... anyone who doesn't think we need a new owner and need actual NFL caliber talent is completely out of touch with reality. So dumb. I don't get it. Air it out. Pick is like a punt. Maybe a PI? Oh, incomplete, same thing as a 6 yard gain on a QB draw. Stupid....Also, pick a F*****g RB and stick with him. sorry. I call it like it is. I may not sound like a good fan sometimes because I sound harsh but I watch a lot of other teams and then compare what I see when I watch my Dolphins play. Our offensive line looks absolutely TERRIBLE! thats the cause of alot of our problems. ZERO Freaking First downs in the first half (that are not from penalty). If we are true fans will will stop buying tickets to dolphins games until they change owner and field some real talent. This is ridiculous. We give Buffalo their first home win (assuming we lose, it's only half time). We also allowed Andrew Luck to break the record for rookie yards as a QB. I'm sick of Miami giving up negative records. They always break negative records. It's frustrating and insulting. This is probably why the ran the draw play. The OL looks like crap. Jonathan Martin is consistently getting bullrushed and Jake Long really looks ordinary out there. Defensively, the DL is not sensing the screen play and Spiller is just going right pass them. Tackling is piss poor. For all the good that was happening a few weeks ago, they are regressing right now, BIG TIME. That's why I'm saying this is embarrassing. All I keep hearing is Jim Mora in my head Playoffs!?!?!? I just hope we can win a game. haha indeed, very painful. very....very painful few weeks in football land. Offensively, its the o-line. Tannehill isn't exactly lighting it up and the backs aren't making good moves, but they are at a disadvantage from the get go with this line. Seriously, its pathetic. Secondary lacks talent. We talked about Tannehill getting figured out...seems opponents have the formula to beat the secondary. Just awful. Is it obvious to Any of our coaches when the Bills are stacking the box? What about Tannehill? Can't he figure this out by now? Heck, he's not even getting mad despite the beating he's taking! He walks around like he is lucky to be there. There was 2 nice passes. Hartline fumbled one & took a forearm shiver to the back of the head on the other. Reggie just got close lined 4 yards behind the line. Thank God for beer, indeed. I'm going to say this again, OUR OFFENSIVE LINE IS TERRIBLE!!!! 22 yards rushing! Tannehill taking shots in the pocket! Pathetic! Offense blanked by an awful defense. RT has had time. For a kid with wheels he has no pocket presence. Tannehill looks like the only competent player on the field today. The offensive line is getting blown off the line of scrimmage. The runningbacks are averaging less than 2 yards a carry. The receivers are fumbling the ball. 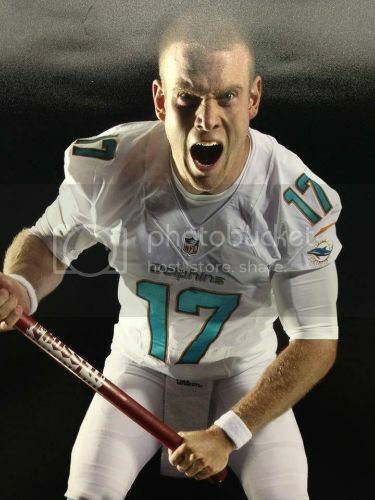 Tannehill is a rookie quarterback with a bad line and only one playmaker who is playing like crap. We will need to overhaul this offensive group next year because Tannehill has nothing to work with right now. Can you imagine if that was Dan in there? Each of those O-lineman would have a popped ear drum from screaming Ha Ha I wish Tanny would at least check their pride. Get a little pissed off. Please!